The next DC Universe Original Movie will be an animated adaptation of classic 2000s graphic novel Hush, originally from writer Jeph Loeb and artist Jim Lee. The story sees the Dark Knight confronting a mysterious new villain called Hush and features a number of friends and foes from the DC mythos. It’s ripe to be brought to the screen, then, and now Warner Bros. Home Entertainment has released a first look at the movie. 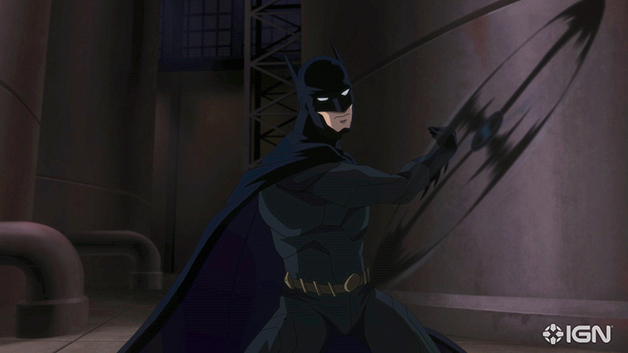 Courtesy of IGN comes our first image from Batman: Hush, depicting the Caped Crusader hurling a Batarang at an unseen assailant. Along with the pic, we also have the casting information for the film and can confirm that Jason O’Mara, a veteran of these movies by now, is returning to voice Bruce Wayne. Meanwhile, Once Upon a Time‘s Jennifer Morrison makes her debut as Selina Kyle/Catwoman, and fans of the recent Death of Superman and Reign of the Supermen movies will be pleased to hear that Jerry O’Connell, Rebecca Romijn and Rainn Wilson will be back as Superman, Lois Lane and Lex Luthor, respectively. Sean Maher (Nightwing), Bruce Thomas (Jim Gordon), Stuart Allan (Damian Wayne) and James Garrett (Alfred) are also on board. What’s more, Maury Sterling is voicing Thomas Elliot, Geoffrey Arend is the Riddler, Vanessa Williams is Amanda Waller, Jason Spisak is the Joker, Adam Gifford is Bane, Dachie Alessio is Lady Shiva and, interestingly, Gotham‘s Peyton List is reprising her live-action role as Poison Ivy as well as providing the voice of Batgirl. Speaking of which, long-term Batgirl voice actor Tara Strong will play a minor role as a reporter. Directed by Justin Copeland and written by Ernie Altbacker, Batman: Hush is produced by Amy McKenna, co-produced by Alan Burnett and Jim Krieg, and has character designs from Phil Bourassa. Executive producers are James Tucker, Sam Register, and Benjamin Melniker and Michael Uslan, and it’s due for release on Blu-Ray and DVD this summer.